Home iPhones Special Offers User Stories Marry Your iPhone!!!! "I really wasn’t looking for a relationship when we met, but since we spent all our time together, we quickly became more than 'just friends.' It was only a matter of time before I got on one knee and proposed. She got so excited she dropped her signal! "~Johnny B. Proud, Madison, WI – this is a quote by a happy groom, whose bride is (somewhat surprisingly) an iPhone! MarryYouriPhone.com has offered a new public service, enabling iPhone users to enter into marriage with their Apple device. 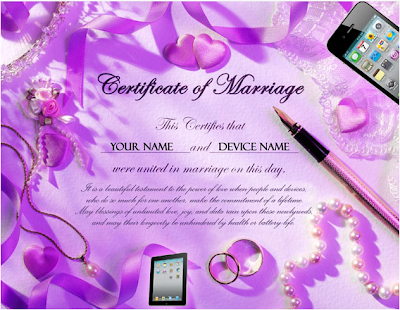 "People love their iPhone so much, it's only natural to want to marry it" said a representative of MarryYouriPhone.com. 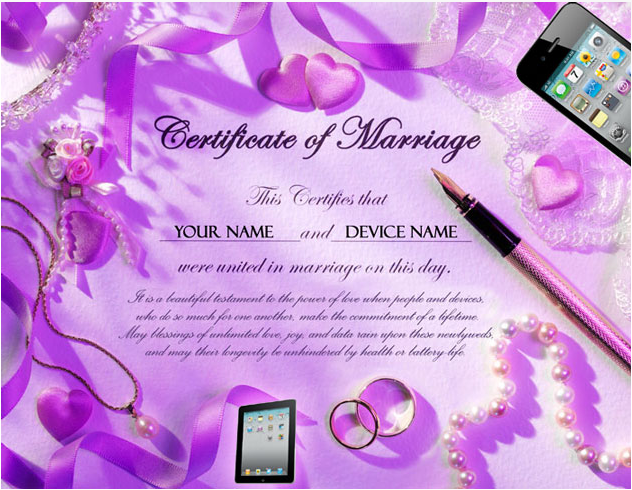 Visitors of the site will be able to purchase an official marriage certificate that will tie them in holy union with their beloved piece of equipment. "People can now show their true commitment to the iPhone beyond the 2-year contract plan. "- says the Director of Communications. Initial feedback from the newlyweds has been awesomely positive, with many experiencing deeper and richer relationships with their mobile devices. Some what interesting are the names trends that aroused after introducing the service: Mary Fernandez-3GS, iSabel 4-Robertson, iSaac 3GS and so on………. MarryYouriPhone.com is also a promoter of iPhone Life Partners rights. The site enables followers to sign a petition to make Human-Device partnerships legal in all 50 states of USA.